My favorite gift I gave. Even though this was the first Christmas with my baby girl, I have to say the best gift I gave this year went to my 4 year old nephew - the Discovery Remote Control T-Rex. It's a dinosaur that works with an infrared remote control so you can make it roar, move it's head and mouth and walk forward. The buttons were really easy for him to figure out how to work, you just needed to make sure you pointed the remote directly at it. It even has rubbery skin and eyes that move when it moves it's mouth. 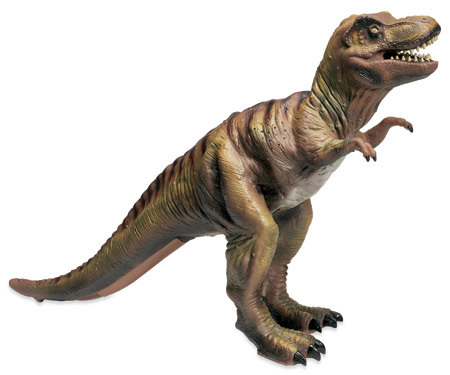 This was the dinosaur toy of my youth. Although it was rad, it's nice to see that things are improving.